The 60 Special popcorn machine from Gold Medal features a 6-oz. stainless steel Uni-maxx/EZ Kleen Kettle, that heats up quickly to pop corn in three-minute popping cycles. If the enticing buttery aroma doesn’t get your attention first, this economical popcorn machine’s attention-getting bright red dome and lighted cabinet will. 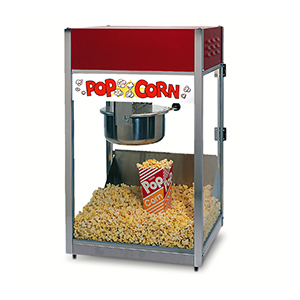 Ideal for low demand operations such as home theaters, employee break rooms, and recreational facilities, you will appreciate this popcorn machine’s heated deck that preserves popcorn’s freshness and its dual acrylic doors that lift for easy cleaning. For convenience, we recommend Naks Pak , a pre-measured corn, oil and salt specifically made for the popper. Please advise the cost of this machine. We don’t need the wheeled base.